According to JLL, restaurants and cafes on the main Moscow high streets in 2018 were the most active: new foodservice units accounted for 40% of annual openings, the share of closed units amounted to 37%. However, in absolute terms the number of F&B openings were 2.5 times greater than closings. More than half (55%) of restaurants and cafes opened on the main Moscow streets were newcomers. In addition, 77% of new restaurant concepts were launched by established restaurant groups. Most newcomers started in the traditional restaurant locations: 16% opened in the Patriarshie Prudy district, 13% of new concepts were launched on Pyatnitskaya Street. Arbat Street and Garden Ring were also supplemented with the new restaurant market players (11% in each locations). Among the newcomers opened in the Patriarshie Prudy are Uilliam Lamberti`s Coco Lambert and Montifiori, and Avocado Queen, the project of Novikov Group. Prscco Bar and coffeeshop Break café were added to the tenant mix on Pyatnitskaya Street. In contrast, among the restaurants closed in 2018 were Glida, Begemot Café and Berezka Bistrot in the Patriarshie Prudy district. Bar Klava relocated from the Patriarshie Prudy to Petrovka Street. The Garden Ring lost El Gaucho near Mayakovskaya metro station and Shesh-Besh near Smolenskaya Square, and the restaurant Yakor on the 1st Tverskaya-Yamskaya Street has been closed. The increase of F&B share is the main trend in Moscow street retail over the past three years. As a result, the restaurants and cafes steadily lead the structure of existing operators. The share of this segment accounted for 45-60% on 5 of 15 reviewed streets by the end of 2018, while the average figure was 36%. 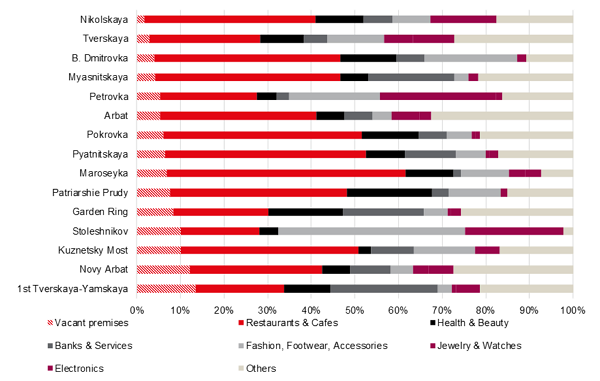 Fashion is the leading segment in the tenant mix structure by the volume of occupied premises in such locations as Stoleshnikov Lane and Petrovka Street (48% and 22% respectively), which are traditionally occupied by luxury brands. On the back of active opening of shopping units in the street retail, the vacancy rate has declined to a four-year minimum of 8.2% in Q4 2018, 0.8 ppt down since the end of 2017. The major decrease occurred on Tverskaya (5.1 ppt down to 3.2%), B. Dmitrovka (4.3 ppt down to 4.3%) and Nikolskaya (3.5 ppt down to 1.8%) streets, which are the locations with the lowest vacancy rates at the end of 2018. The central part of the Patriarshie Prudy area, between Yermolaevsky, Maly Patriarshiy & Spiridonyevskiy lanes, and Malaya Bronnaya Street. Rents are given for premises of 100-300 sq m with a separate entrance and a showcase on the first floor inside the Third Ring Road.